Heading Out with Dave & Donna | Pack your bags. Geology is the goal, but anything natural or prehistoric along the way is fair game as we head out. 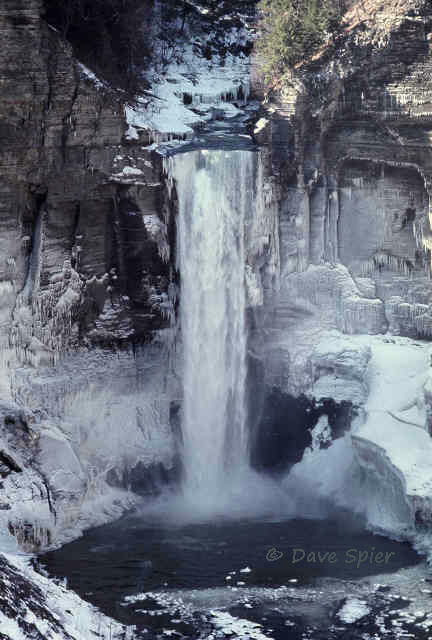 The falls is capped by massive layers of Tully limestone deposited in a shallow inland sea during the Devonian period. The soft, underlying Hamilton-group shale is easily eroded and allows blocks of the limestone to break along joint planes and fall into Salmon Creek. 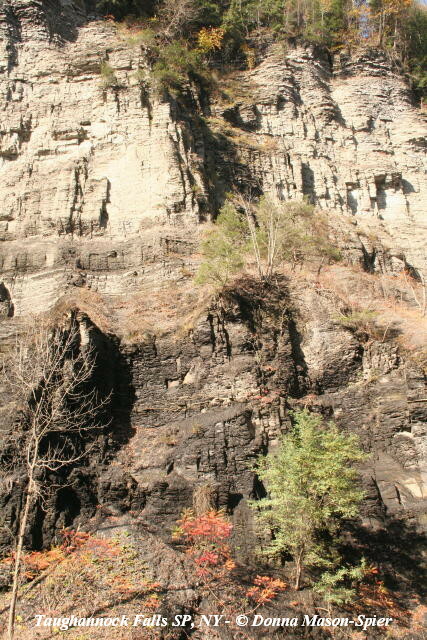 Under the south edge of the falls, shale erosion continues to create a large “cave” roofed by the Tully. 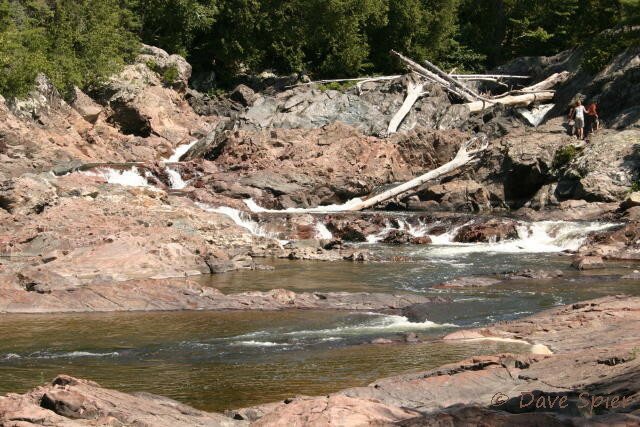 A very slight strata dip to the northeast results in water flowing over the straight edge of the falls only during spring runoff or following heavy rain storms. The nearly-flat sedimentary strata across the Finger Lakes region has mainly a slight southerly dip. Combine this with the gradual, northward descent of the land to the Lake Ontario plain and you get a low escarpment where the Tully limestone outcrops on the surface. Unfortunately, Ice Age glaciers essentially obliterated much the Tully escarpment, so it doesn’t have the prominence of the Lockport dolostone to the west (in the Niagara region) or the Onondaga escarpment to the east (around Syracuse and beyond). 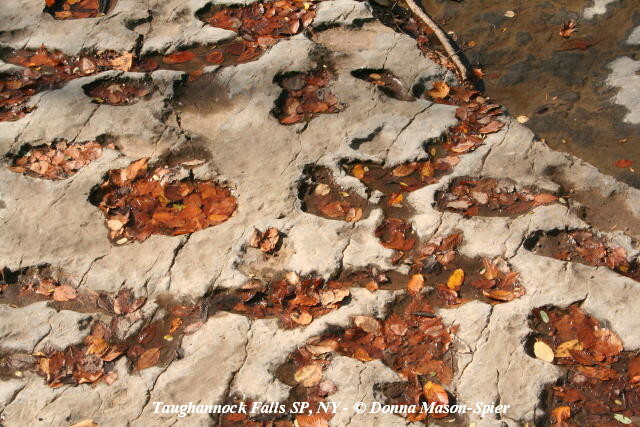 Tully limestone also creates the lower falls at the mouth of the Taughannock gorge just upstream from the delta. West of Seneca Lake, the Tully is exposed at a falls on Kashong Creek in the hamlet of Bellona midway between Penn Yan and Geneva. South of that falls is another one exposed at Cascade Mills on the Keuka Outlet between Penn Yan and Dresden. That and the Seneca Mill falls are easily accessible from the Keuka Outlet Trail, but we’ll save them for another blog post. Directions to Ludlowville: From the south take Route 34 north from Ithaca, turn left (west) on Route 34B in South Lansing, continue to Ludlowville Road, and turn right for a short distance. The park will be straight ahead, just across Salmon Creek Road / Mill Street. It’s then a short walk across the grass to the fence overlooking the falls. From the north, Routes 34/34B connect Auburn to Ithaca. For more information, there is a facebook page devoted to the falls. It’s emphasis is fossil hunting. 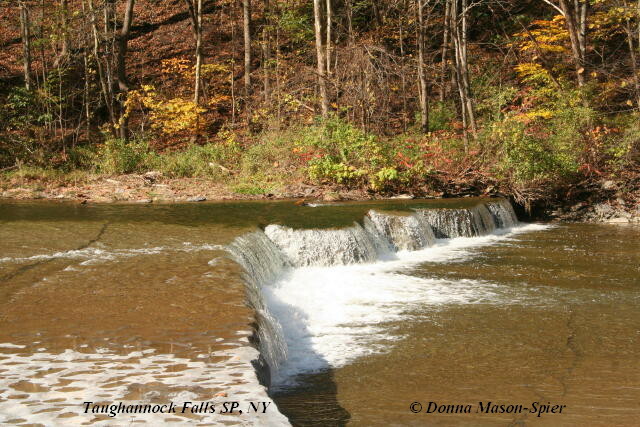 For a regional waterfall guidebook or a downloadable e-book version, buy 200 Waterfalls in Central & Western New York – A Finder’s Guide by Rich & Sue Freeman. It covers the area from Niagara to Utica and Jamestown to Binghamton. Ludlowville is on pages 236-237 of the 2002 edition. Also check their website for updates to the book. Corrections, comments, and questions are always welcome at northeastnaturalist@yahoo.com or connect through my Facebook page and photo page. For topics in the northeast, there is a separate community-type page at The Northeast Naturalist. Other northeast nature topics can be found on the parallel blog Northeast Naturalist. 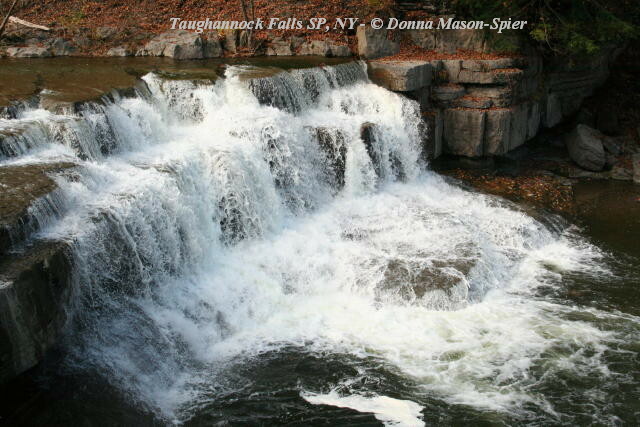 The highest single-drop waterfalls in New York State is accessible from Rt. 89 northwest of Ithaca in New York’s Finger Lakes region. Taughannock Creek flows east as it descends the west slope of the Cayuga Trough to end in Cayuga Lake where it has created a flat delta. 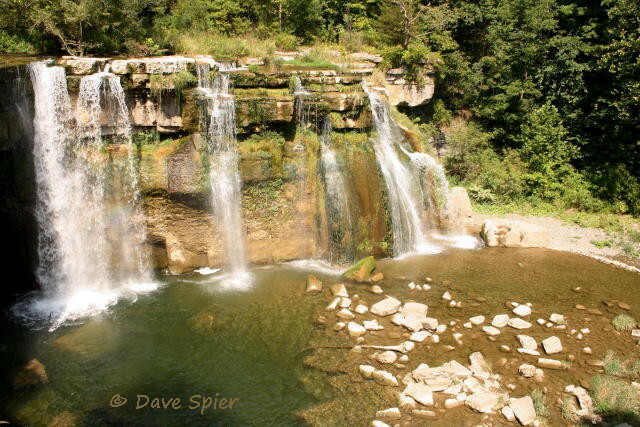 Since the end of the last Ice Age, two significant waterfalls have cut an impressive gorge into the Allegheny Plateau. To get a better overview of the park, I suggest first starting at the falls overlook on the north rim about a half mile uphill from Rt. 89. You’ll see part of the lower gorge below the main falls, the 400′ high amphitheater surrounding the falls, and you can glimpse the upper gorge above this falls. Further uphill (either by driving or by waking the rim trail) you can reach the old railroad bridge over the upper gorge and view the upper falls just below Falls Road. Drive downhill on Taughannock Park Road and turn right (south) on Rt. 89, cross the creek and pull into the lower parking lot on your right. (In warm weather, if this lot is full, there are larger lots on the east side of Rt. 89, toward Taughannock Point, the delta created from sediments washed out of the hillside.) If you happen to return via Gorge Road on the south side, it would be a left turn at Rt. 89. After a short walk from the lower parking area, you can see the first, fairly-low falls created by the resistant Tully limestone caprock. Weak Hamilton shales at the base of this falls easily erode and allow blocks of the Devonian-age limestone to break off. As you can see in the photos, it’s possible to walk down to the creek bed and examine the solution pits on the limestone surface. 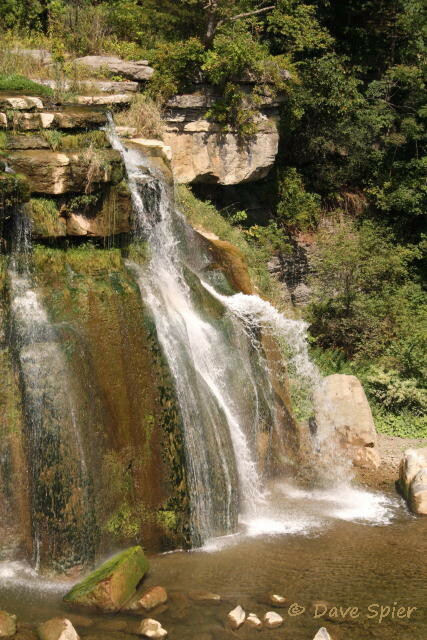 Above the lower falls, the creek has washed off the relatively flat surface of the Tully up to a wide “step” falls created by another layer of the limestone. Above that, flat surfaces with minor steps continue upstream until they disappear under the dark, almost-black Geneseo shale. Along much of the three-quarter mile walking trail up the lower gorge, you’ll have first-hand access to this weak shale that crumbles and piles into talus slopes at the base of the cliff walls. 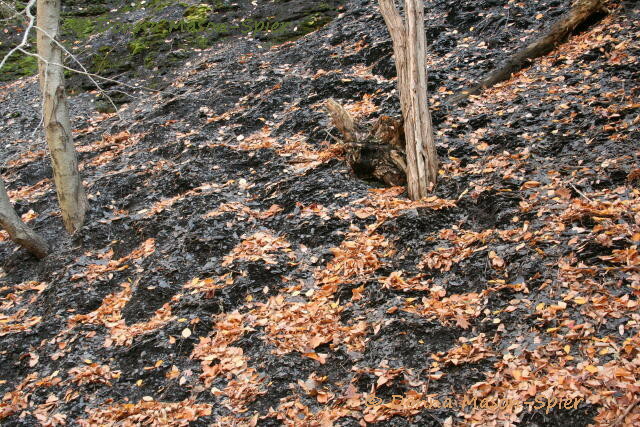 Black Geneseo shale forms talus slopes beside the lower gorge trail. If you look above the dark shale, you’ll see the beige cliffs formed by more resistant Sherburne siltstone, slightly younger rock overlying the Geneseo formation. Both are members of the upper Devonian Genesee group. 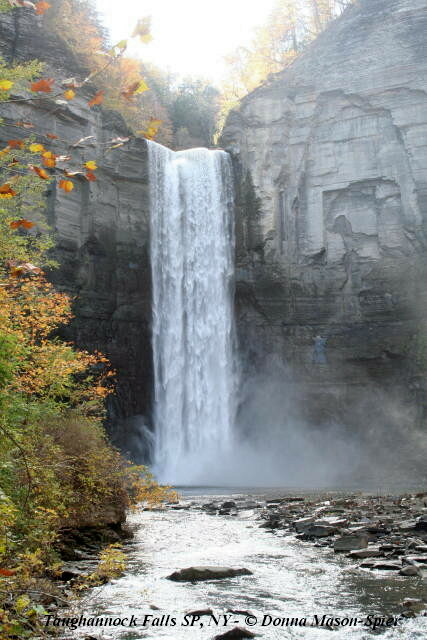 As you continue upstream to the base of 215′ high Taughannock Falls, the gorge deepens until you reach the wide amphitheater surrounding the main falls. 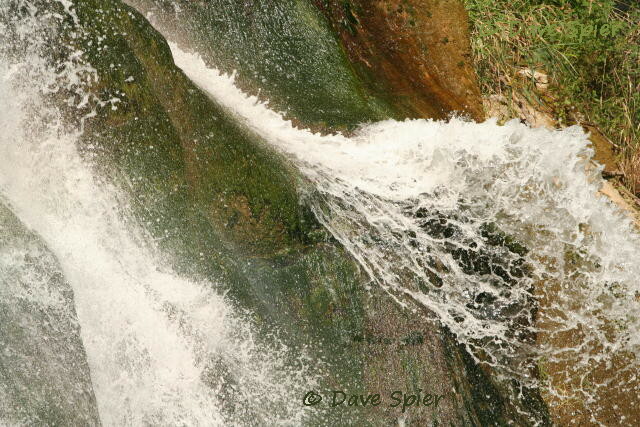 The highest portion of the cliffs are Ithaca shale beginning about 25′ above the crest of the falls. At that point the gorge is about 400′ deep. You can get a good view of the falls from the footbridge over the creek, or you can continue a short distance to the last viewing area, but spray and mist often soak this spot. 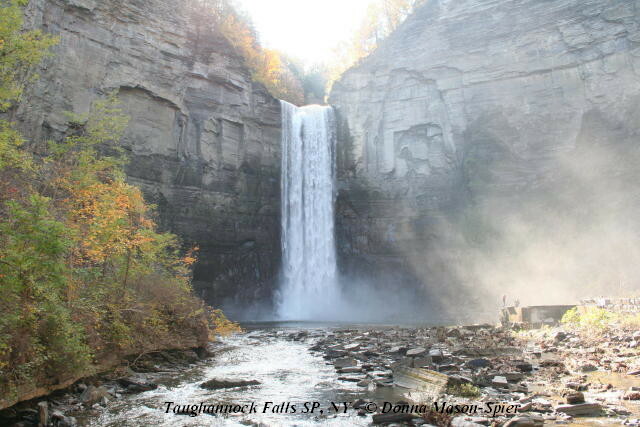 Yes, Taughannock is higher than Niagara, but of course it lacks the width and volume of water. (After all, Niagara drains the four upper Great Lakes on their way to Lake Ontario.) The highest water volumes are usually in early spring following snow-melt. Heavy summer storms can suddenly raise the water level and, in the past, have washed out portions of the trail. Allegany State Park, in the southwestern part of New York State, is unique to the area in never having been glaciated during the Wisconsin ice advance. The glacier stopped just short of the Allegheny River Valley that surrounds the park. Besides lacking the typical deposits of ground moraine, the park’s hills were spared the scouring effect of a bulldozing ice sheet. 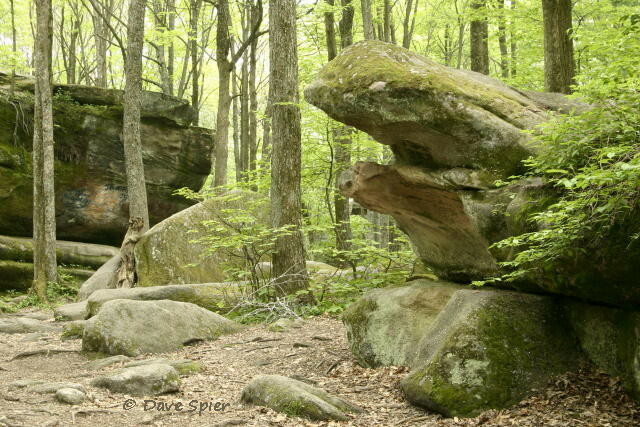 Thunder Rocks is one of several “rock cities” on hilltops near the Pennsylvania line. 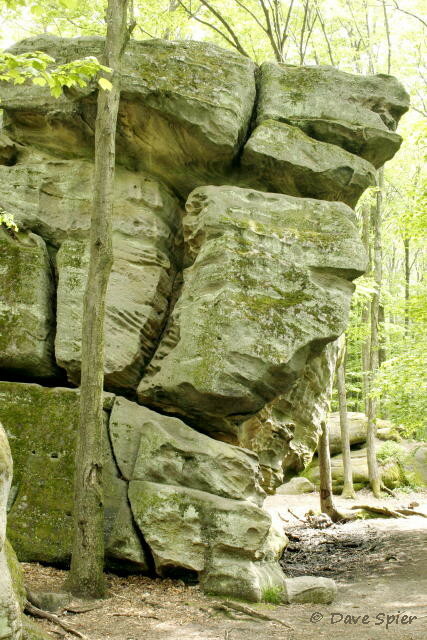 It is made of huge, joint-fractured Olean conglomerate blocks from the Pennsylvanian period, the same massive rock type that forms its more-famous cousin, Rock City, southwest of Olean. Other outcrops littering hilltops in the region come from different conglomerate layers in other geologic periods including the Mississippian Pocono group. West of Jamestown, the Wolf Creek conglomerate at the base of the late Devonian Conewango group forms Panama Rocks. All of the photos in this blog were taken at Thunder Rocks with the exception of the Salamanca conglomerate closeup. Higher-resolution copies of the first two photos can be found on National Geographic’s Your Shot here and here. Conglomerate is essentially nature’s concrete. It contains numerous pebbles or even cobbles plus sand and silt cemented together by either limestone, iron oxide, silica or clay. 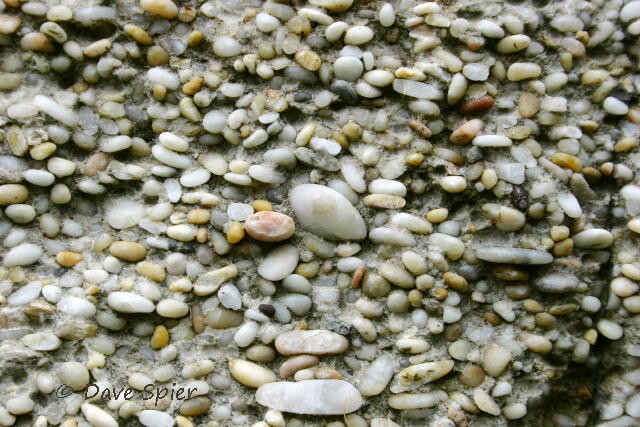 It is sometimes called “puddingstone.” Conglomerates can occur in massive beds resistant to erosion. In the Allegany region, they are underlain with soft shales that easily erode and allow the conglomerate to break along joint planes. Soil creep then slowly carries the blocks downhill. 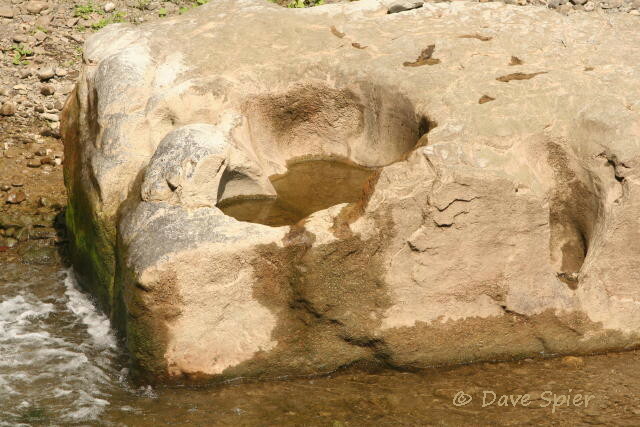 Olean conglomerate blocks from the Pennsylvanian period form Thunder Rocks. Note the cross-bedding in the middle layer. Salamanca conglomerate, found chiefly at Bear Caves in Allegany SP and Little Rock City northwest of Salamanca, is from the late Devonian Conewango group. 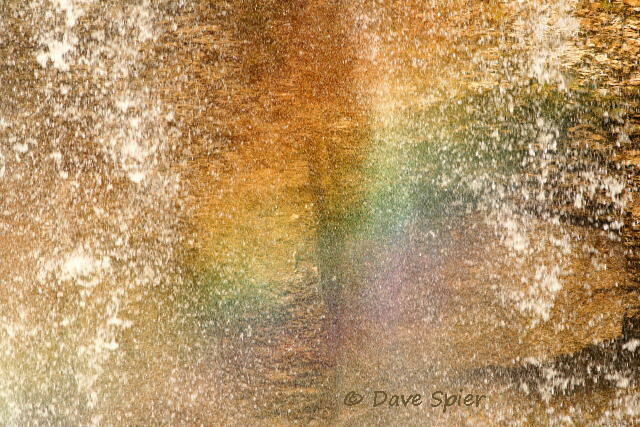 This closeup is part of a boulder at a parking area elsewhere in the park. 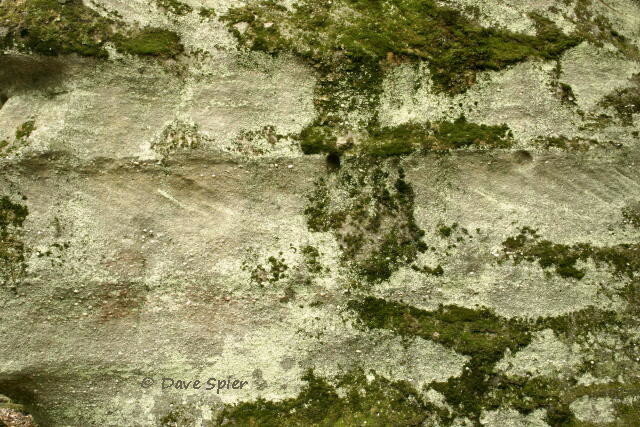 Maps and non-technical information on visiting Thunder Rocks can be found on the Enchanted Mountains – Cattaraugus County website. A separate page lists several other nearby sites on the Cattaraugus County Geology Trail. There is a brief mention of Thunder Rocks on page 173 in Roadside Geology of New York, by Bradford VanDiver, PhD, 1985/reprinted 2003, published by Mountain Press. These photos were taken during the annual Allegany Nature Pilgrimage held the first weekend after Memorial Day. There’s usually at least one geology hike during the event. For most of these photos, camera white balance was set to “cloudy” for the overcast day, but light filtering through the spring canopy gives some scenes a slight greenish cast. 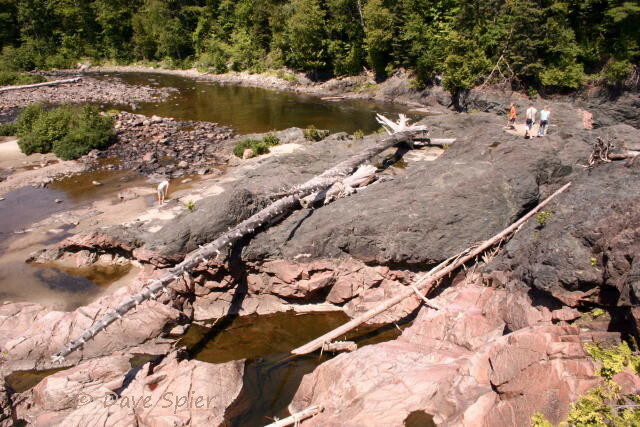 At the east end of Lake Superior, Highway 17, the Trans-Canada Highway, crosses the Harmony River on the east side of Batchawana Bay near Harmony Beach. (This is the second bay on Lake Superior north of Sault Ste. Marie.) Just upstream from the bridge, a wayside park provides access to Chippewa Falls, which is actually two cascades 150 feet apart. 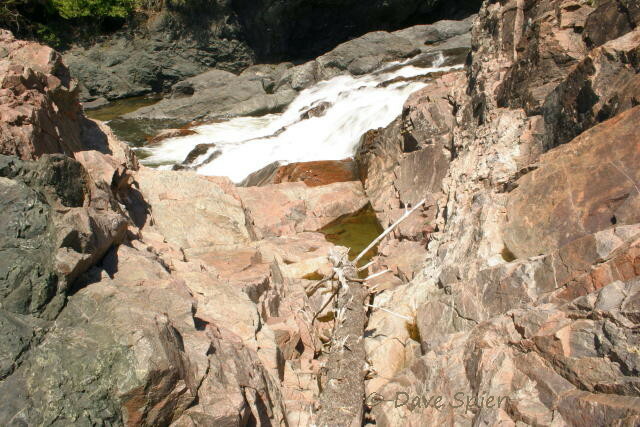 The original bedrock is 2.7 billion-year-old pink granite, but, at the lower falls, it is still covered with a remnant of a 1.1 billion-year-old lava flow called the Keweenawan basalt that was extruded during the Grenville orogeny. 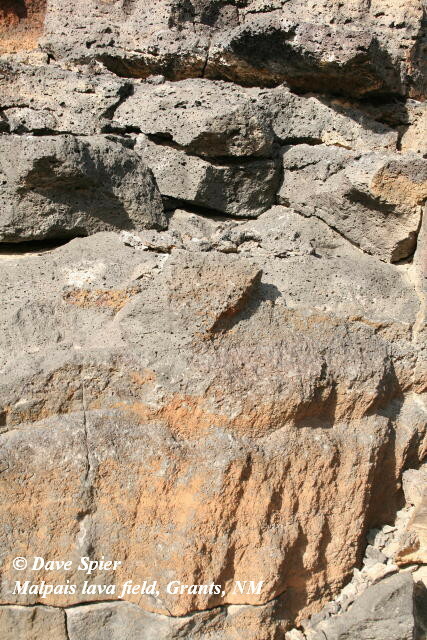 The contact between the two rocks types represents 1.6 billion years of erosion that brought the granite to the surface by the time of the volcanic activity. A lateral fault cuts through both layers on the north side of the present-day lower falls (out of sight in the two opening photos). 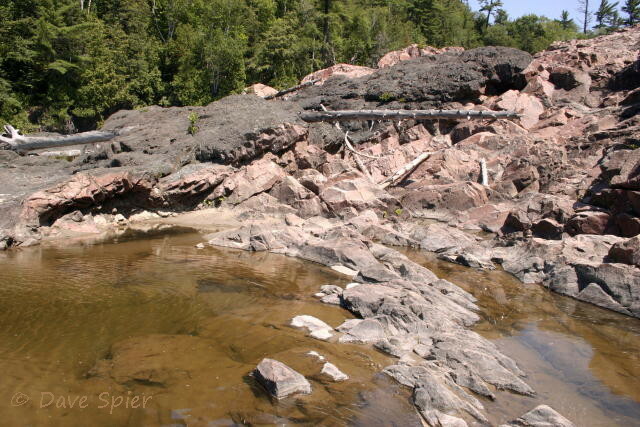 A remnant of the gray, 1.1 billion-year-old lava flow called the Keweenawan basalt, extruded during the Grenville Orogeny (mountain-building episode), covers the 2.7 billion-year-old pink granite next to the lower Chippewa Falls (hidden right rear). 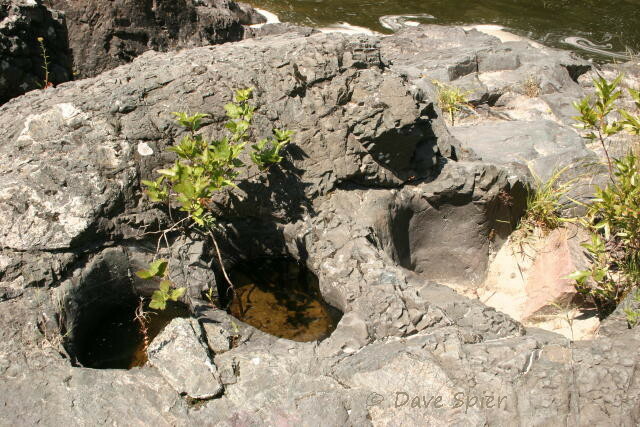 Potholes in the Keweenawan basalt are geologically-recent erosion features resulting from swirling eddies carrying abrasive sand, gravel and cobbles in a circular motion that grinds them down into the base rock. 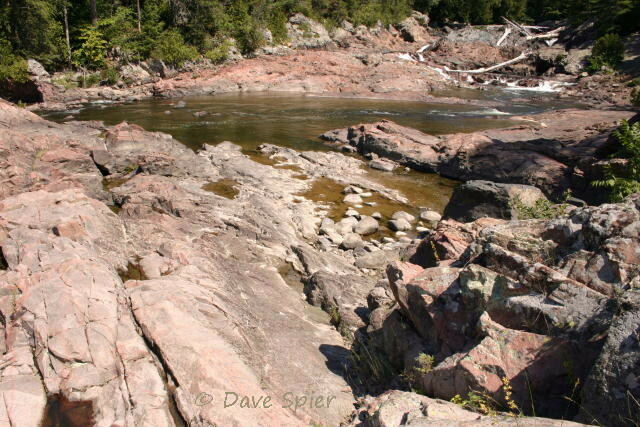 A small remnant of the gray Keweenawan basalt covers the pink granite as we climb toward the lower Chippewa Falls. 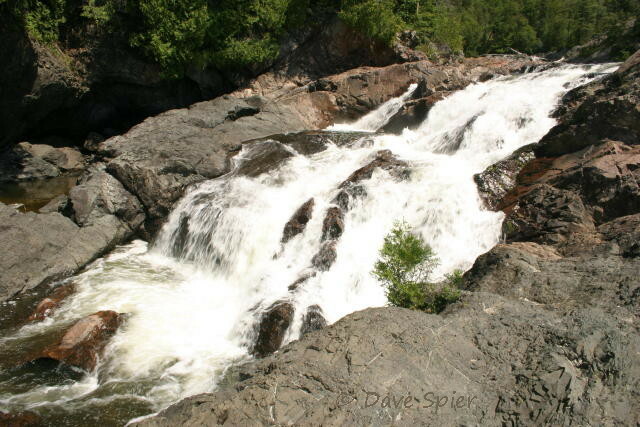 The upper falls was created by a vertical diabase dike cutting across the granite. Here the fault displaces the dike by 30 feet upstream on the northwest side of the river. The upper falls can be reached by an 800 foot trail from the parking area although we didn’t have time to try it. 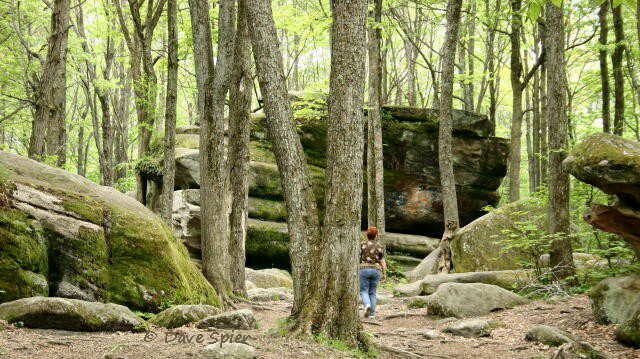 Apparently the trail continues another 500 feet upstream to a bed of large boulders. If you were able to travel six miles further upstream, you’d reach the confluence with the Chippewa River. 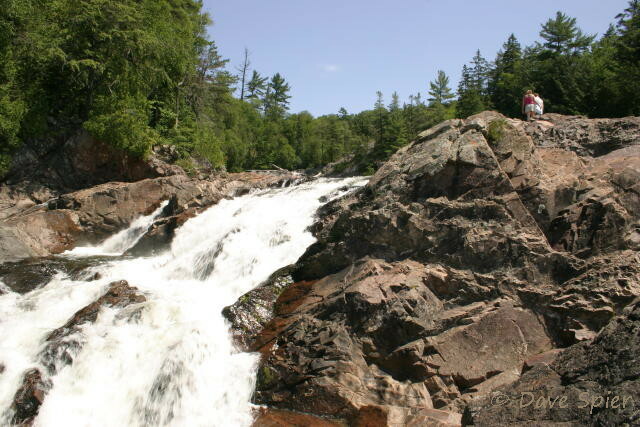 The upper Chippewa Falls was created by a vertical, gray, diabase dike cutting across the pink granite. Here the fault displaces the 65-foot thick dike by 30 feet upstream on the northwest (left) side of the river. Corrections, questions and suggestions are always welcome at northeastnaturalist@yahoo.com or connect through my Facebook page and photo page. There is a separate community-type page for The Northeast Naturalist. Other nature topics can be found on the parallel blog Northeast Naturalist. 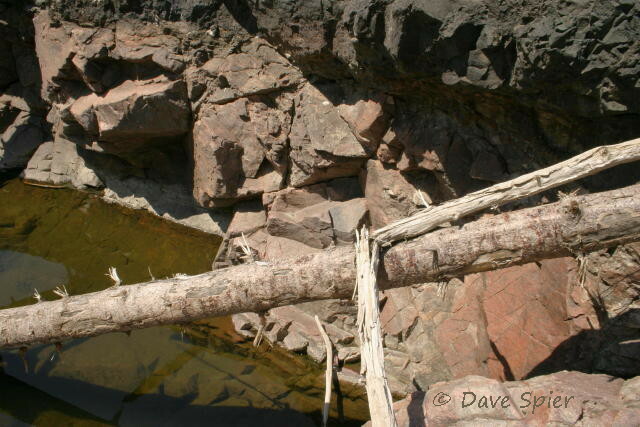 Logs become trapped in erosional features that often result from joints and other fractures. Note the dark basalt at the top overlying the granite underneath. Imagine being inside a volcano. 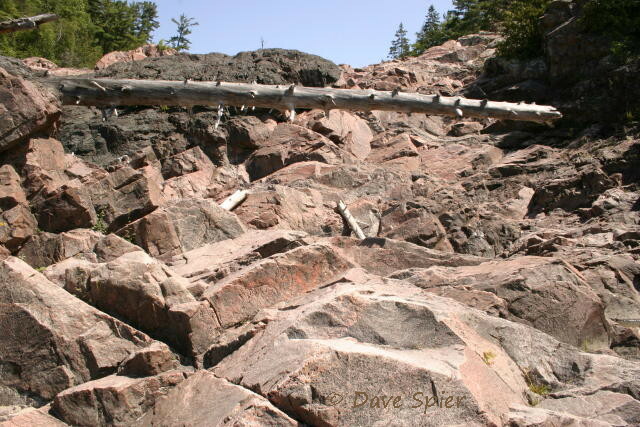 The best way is the Under-the-volcano Trail in Neys Provincial Park; it meanders for a kilometer along the rocky shore of Lake Superior west of Marathon, Ontario. Roughly a billion years ago (sometime around the end? of the Grenville Orogeny, depending on how much that time estimate was rounded), there was an active shield volcano forming a wide, low-relief cone here. 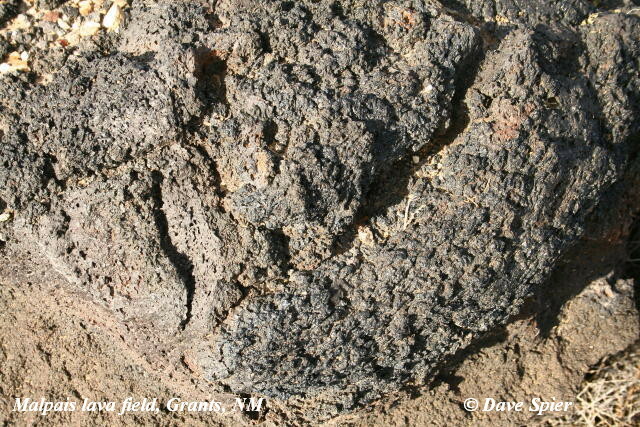 After the magma cooled, the cone gradually eroded down to the present surface exposing the heart of the magma chamber. It still requires some imagination, but you are walking on what had been the interior of a magma chamber. Station #2, Coldwell Alkaline Complex, is a large-scale map of Lake Superior’s north shore around and west of Marathon, Ontario. Superimposed are generalized locations of the three main magma chambers. 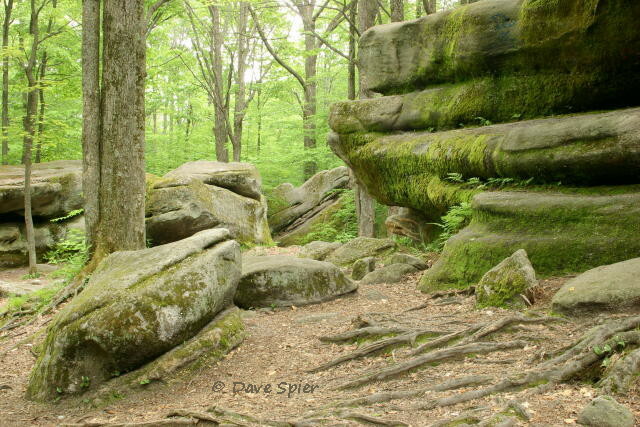 “The rocks along this trail are part of a unique feature called the Coldwell Alkaline Complex. Coldwell refers to the nearby historic fishing community of Port Coldwell. Alkaline refers to the high level of chemical elements such as sodium and potassium in the rock. By comparison, the surrounding rocks are rich in aluminum. This is the largest collection of alkaline rocks in North America. Complex refers to a group of related rocks. This complex includes several magma chambers or centers, which geologists have grouped into Centre 1, Centre 2 and Centre 3,” according to the interpretive sign. If Center 2 in Neys Park is any indication, each center contains several closely-related intrusions. The sign continues, “Under great heat and pressure, solid rock becomes molten rock or magma. When magma cools it forms igneous rock. Igneous comes from the Latin word [for] ‘fire.’ All the rocks of the Coldwell Alkaline Complex were born of fire.” Neys Provincial Park lies near the west edge of the Complex on the Coldwell peninsula. Port Coldwell is near the center of the three magma chambers (cauldrons) which together span roughly 15 miles. Each successive intrusion is relatively northwest of the previous but intertwining of the magmas confuses the issue. Station #5, Nepheline Syenite. “You are standing on nepheline syenite, a rock formed in the magma chamber of the Coldwell Alkaline Complex. Syenite is a rare rock in the Earth’s crust. Nepheline syenite is even less common. Minerals visible within the syenite are Nepheline (gray, greasy, cloudy), Amphibole (black, shiny prisms), Natrolite (bright red, irregular patterns), and Alkali feldspar (pink, shiny rectangular). / Nepheline syenite is one type of rock. Rock is made up of various combinations of minerals which, in turn, are composed of a combination of elements. As the magma in the chamber slowly cooled, elements combined together and crystallized as minerals. …” Syenite is a pinkish rock similar to granite but lacking quartz. The exact color depends on weathering. It seems to vary from beige to deep pink, but freshly broken sections are textured with black, gray, light-pink and red (due to the four main minerals). Station #6, Ghosts in the Magma, explains two separate intrusions within Center 2. 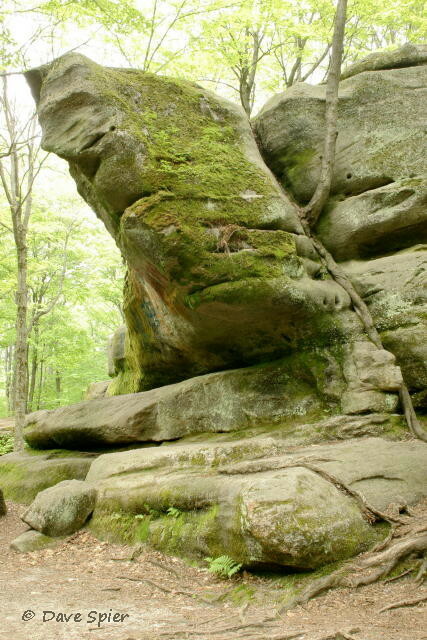 (The surrounding country rock in the diagram is not identified, however, and there is no scale on the sign.) “Numerous grey and bleached rock fragments are exposed in the syenite at your feet. Molten syenite intruded into an older, dark coloured rock. Fragments of the older rock, swallowed and partially absorbed by the magma, now lie like faint ghosts in the syenite. … The fragments are called xenoliths. ‘Xeno’ means foreign; ‘lith’ means rock. The ghosts are foreign rocks within the syenite.” Continuing along the trail will take you to the main body of gabbro, the dark rock that rose first and cooled before the syenite entered. Station #7, Biotite Gabbro. “You have just crossed a contact between nepheline syenite and biotite gabbro. … The contact is dramatically exposed, showing the difference between the smooth, hard nepheline syenite and the pitted, soft biotite gabbro. 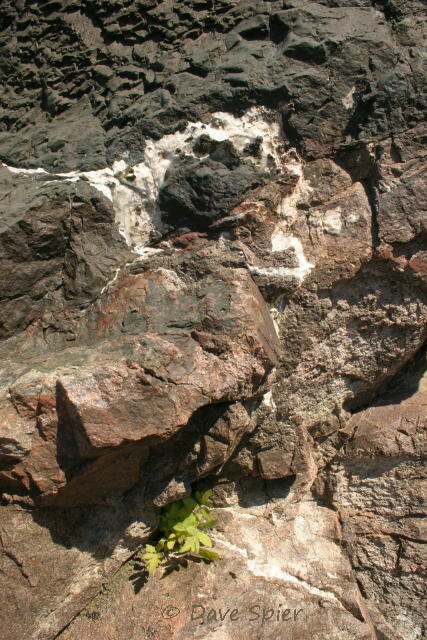 Gabbro is the second major rock type in Centre 2 of the Coldwell Alkaline Complex. The soft nature of biotite mica, the main mineral of this gabbro causes the gabbro to erode faster than the nepheline syenite.” Gabbro is a dark igneous rock that cooled from magma rich in biotite (black) mica. The park visitor center has additional information, maps, and samples of the various rocks on display. From Center 1 (the largest, surrounding Marathon and extending north and northwest in what are now discontinuous units) there is an example of the ferroaugite (a.k.a. augite-amphibole) syenite and gabbro. This was later intruded in two stages by the Center 2 magma chamber (around Coldwell and Neys Park plus outlying units north and south). The initial biotite gabbro of Center 2 was subsequentlly invaded by pinkish nepheline syentite during a later stage of that chamber. Center 3 consists of granite, quartz-syenite, hybrid syenites (including ferro-edenite) and syenite-synodiorite. Corrections, comments and questions are always welcome at northeastnaturalist@yahoo.com or connect through my Facebook photo page, my personal page, and The Northeast Naturalist page. Other outdoor topics (mostly nature and birding) can be found on the parallel blogs northeast naturalist and Adirondack naturalist. 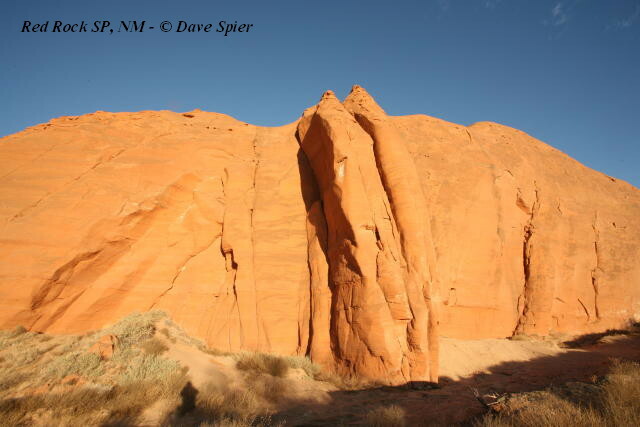 East of Gallup, New Mexico (USA), Interstate 40 passes along the south edge of the reddish Wingate Cliffs composed of Entrada Sandstone. 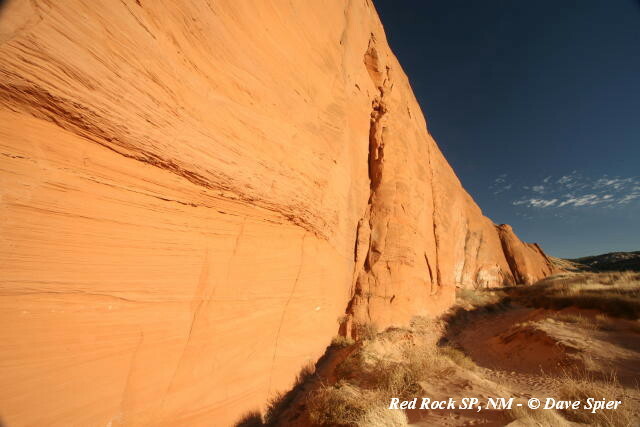 About 2/3rds of the way from Gallup to Wingate, at exit 31, you can access Red Rock Park (originally a state park and now part of the Navajo Nation) nestled into the dissected edge of the cliffs on the west side of Rt. 566. The Entrada Formation is part of the San Rafael Group on the Colorado Plateau. It formed during the Late-Middle Jurassic from cross-bedded sand dunes in a Sahara-like environment around 160 (+/- 20) million years ago. The unit is named after Entrada Point in Emery County, Utah. 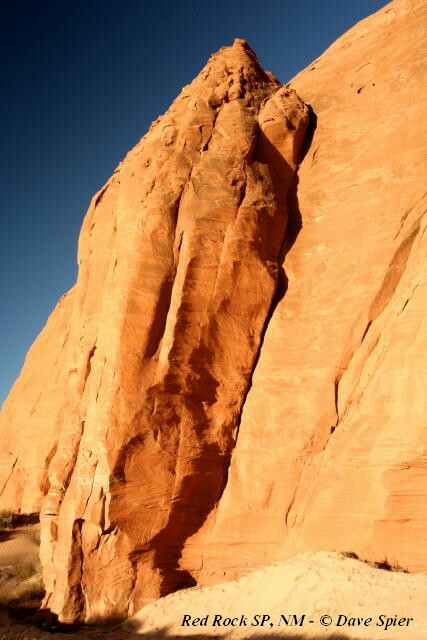 In the vicinity of Red Rock Park, the lowest cliff layer was named the Iyanbito member which sits unconformably on top of the soft mudstones of the Triassic-age Owl Rock Member/Petrified Forest Member of the Chinle Formation underlying the valley eroded by the Puerco River and its tributaries. For a technical discussion with a map and rock columns, refer to USGS publication 1395d (1974). 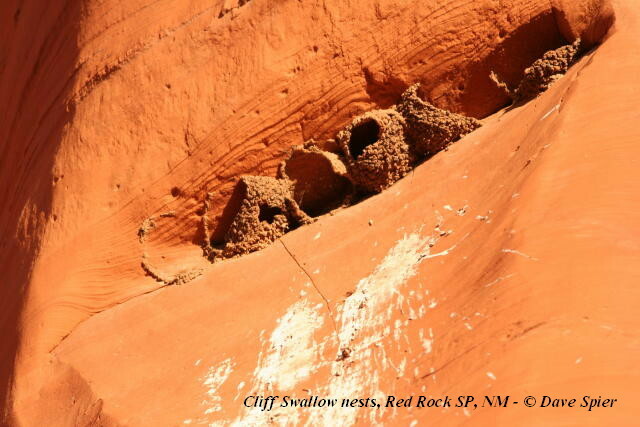 The Red Rock Park’s Jurassic deposits are overlain with younger Cretaceous rocks which form high ridges north of the park. Lucas, S.G., Heckert, A.B., Berglof, W.R., Kues, B.S., Crumpler, L.S., Aubele, J.C., McLemore, V.T., Owen, D.E., and Semken, S.C., 2003, Second-day road log from Gallup to Fort Wingate, Sixmile Canyon, Ciniza, Red Rock Park, Church Rock, White Mesa, Thoreau, and Grants, New Mexico Geological Society Guidebook 54, p. 35-68. East of Grants, New Mexico (USA), Interstate 40 passes through the north end of the El Malpais lava fields. 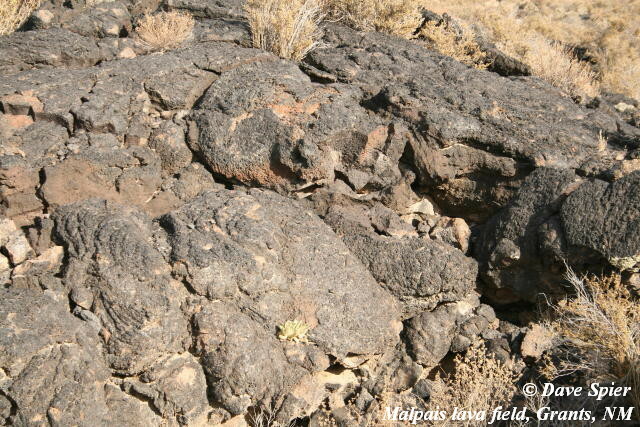 (Malpais is Spanish for “badlands” and was used by early map makers to describe volcanic terrain.) 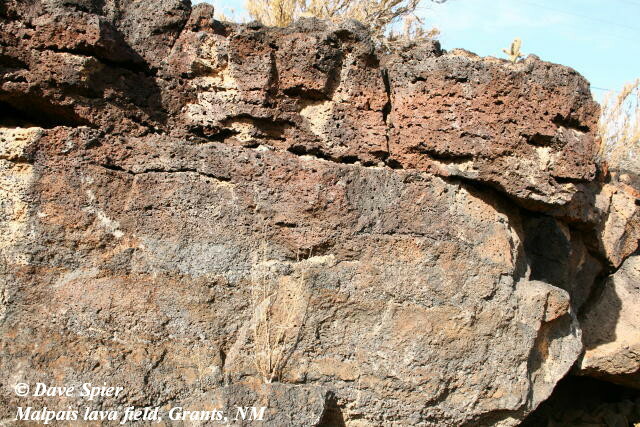 The area is related to the Zuni-Bandera volcanic field. Of the numerous basalt flows, two reached the present I-40/Rt. 124 highways. The youngest, the McCarty flow, is a mere thousand years old. Stop at the mile 93 rest areas for a closer look or drive Rt. 124 parallel to the interstate. The older Calderon flow reached to Grants and can be accessed from the exits. The small volcanoes at the source are 20-30 miles southwest in El Malpais National Monument which is reached by Routes 117 and 53. On Google Earth 6.2, you can zoom in on I-40 between Grants and McCarty’s to the southeast. 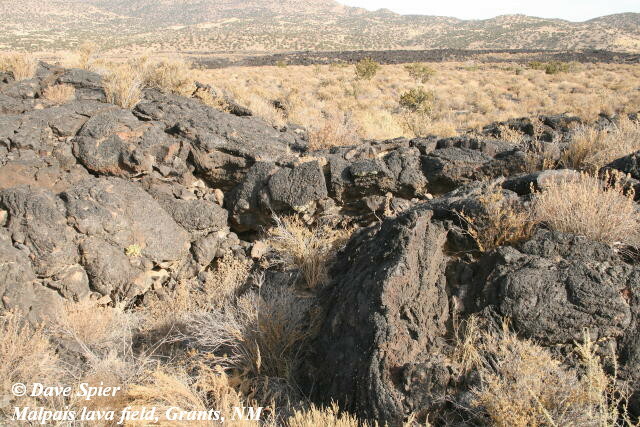 (Exit 89 GPS co-ords are 35° 05′ 04.82″ N, 107° 46′ 12.77″ W) The geologically “recent” McCarty’s lava flow is an irregular black line heading north along the west side of Rt. 117 at the base of the Las Ventanas Ridge, then widening and “pooling” east of exit 89 (where Rt. 117 begins at I-40), then streaming east-southeast along Rt. 124 (Historic Rt. 66) most of the way to McCarty’s. The dissected north rim of the McCarty’s Mesa is south of Rt. 124 and formed the southern barrier constraining the lava. The older Calderon lava flow is an irregular brownish-gray blob west of exit 89 on the Google aerial view.